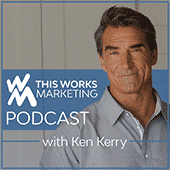 Welcome to the inaugural edition of This Works Marketing Live, our Facebook Live show hosted by Barbara and Ken Kerry that we produce and air every Wednesday on our Facebook page! TWM Live is dedicated to bringing you up-to-date business marketing information, strategies and concepts, as well as interviews with some of the most interesting figures in marketing and business today. While you can always catch new episodes when they happen — follow us on Facebook and you will be notified when we are going live — we like to provide as many ways as possible for you to consume the information inside them at your leisure. You can watch our TWM Live Archives in our Facebook Video Archives, by clicking on the Facebook Live category on this blog, or even by subscribing to our iTunes page, where we make all the shows available as a podcast, so you can absorb the information in your car, while you work out, or wherever you want. We all consume information in different ways, so feel free to pick the version that suits you best! M2 has set up and managed direct marketing campaigns for companies ranging from small startups, to well-known brands like Gwynnie Bee, Cuisinart and Gibson. Their experience in managing 360 degree performance marketing campaigns is focused not just on awareness, but in developing sales with verifiable, trackable metrics, so the strategies they discuss in the episode are invaluable to any CMO or marketing professional looking to find new customers and scale their company. We hope you enjoy this first episode. If you find this information useful, please share it with someone you also think might benefit from it, as well as follow/subscribe in whichever format best fits your lifestyle to stay up-to-date on current episodes!